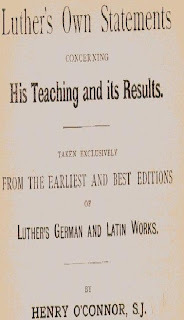 Luther's Own Statements Concerning His Teaching and Its Results is an old small anthology of Luther quotes peppered with vilifying commentary from Roman Catholic polemicist Henry O’Connor. In an early edition of this work, the author was so sure of his effort he originally titled the book, "The Only Reliable Evidence Concerning Martin Luther." The author claims to have compiled the quotes from the original sources: “Nearly two-thirds of the matter contained in this pamphlet is taken from the original editions of Luther’s own Works, as published in Wittenberg, under the very eye of the Reformer of Germany himself”(p. 3) He says “I have taken special care not to quote anything, that would have a different meaning, if read with the full context”(p.5). My copy is the third edition published by Benziger Brothers (New York and St. Louis). I've had this book for a few years now. Before the advent of Google books, I collected books about Luther by Roman Catholics. This book was mentioned by a Roman Catholic web-page, and I was able to track down my own copy, which was not easy, nor cheap. Now, the Internet has pretty much put an end to tracking many of these old books down. This book belongs to the Roman Catholic vilifying anti-Luther tradition that I've often commented about. You can read about the earlier hostile Roman Catholic evaluations of Luther in my paper, The Roman Catholic Perspective of Martin Luther (Part One). Previous to the 1900’s, a Roman Catholic tradition of criticism based more on attacking Luther the person rather than Luther the theologian was a common method. Men like Cochlaeus, Denifle, Grisar, Ganss, O’Hare, and O'Connor, wrote extensively against Luther. They presented him as a child of the devil, a drunk, a lustful sexual deviant infected with syphilis, a liar, ignorant of correct theology, a manic-depressive, the creator of a theological system to justify a sinful lifestyle, a prideful blasphemer, a promoter of divorce and polygamy, and a host of other charges. During the early 1900’s, a tradition of a more balanced Catholic criticism slowly emerged. These Catholic scholars desired to understand the theological issues raised by Luther rather than setting up vilifying caricatures. Luther was no longer viewed as Satan’s son, but rather as a sincere religious man and an honest theologian. Sure, Luther was still wrong, but he wasn’t wrong because he was the evil blaspheming son of the devil. He actually had some good points, and was misunderstood by earlier Catholic criticisms. To read my overview of the more balanced Catholic opinions on Luther, see my paper: The Roman Catholic Perspective of Martin Luther (Part Two). When it was published, O'Connor's received praise from Roman Catholic sources. Here is a link to one such positive review..."The work should be in every priest's library, so as to be at hand for immediate reference." We find ourselves now in the age of the Internet. The works of destructive Roman Catholic scholars, most of which had been long out of print, now find a new voice, and sometimes a loud voice. I've observed that their charges against Luther the person have flourished, while Roman Catholic works positive towards Luther are often completely ignored by Rome's cyber-defenders. Rome's recent polemicists are prone to resurrect the earlier destructive Luther scholarship. It's not uncommon for these defenders to refer to Ganss or Patrick O’Hare, lifting Luther citations from their works. The Internet apologists freely cite English translations of Luther with German or Latin references. It's obvious from this that Luther isn’t being read in context, but rather these earlier destructive critical texts are being used. It would be hard for me to imagine any serious current Roman Catholic writer using O'Connor's book as a resource for information about Luther (with the exception, if they were presenting a history of Roman Catholic Luther scholarship). O'Connor boldly declares Luther to be in league with Satan: "A man who Pretends to be a Reformer is sent either by God or by Satan" (p. 61). Earlier in the book, O'Connor presents an entire section linking Luther, and Luther's teachings to the Devil: "Luther received the full and unqualified approval of the Devil for these new doctrines. It was the Devil who spoke in favour of the new doctrine of justification by faith alone, and against Mass, Mary, and the Saints" (p.18). He argues Luther was a liar, a hypocrite, one who wrote a "Satanical book", it is Satan that speaks through Luther, Luther has a "Satanical hatred of the Pope," he was responsible for the deaths of 100,000 peasants; where Luther's teaching is accepted the sick, poor, and children are neglected, and drunkenness spreads like a deluge. And, these are only a few of the the charges and attacks against Luther. I've gone through a number of the Luther quotes used by Henry O'Connor. This blog entry will serve as a master list for quick reference. Here are pages 56-57 of O'Connor's book with hyper-links to the contexts of the quotes he uses. IX.—Lower State Of General Morality. 1. Luther says: "As soon as our Gospel began decency and modesty were done away with, and everybody wished to be perfectly free to do whatever he liked." 2. "We deserve that our Evangelicals (the followers of the new Gospel) should now be seven times worse than they were before. Because after having learnt the Gospel, we steal, tell lies, deceive, eat and drink (to excess), and practice all manner of vices." 3. "After one Devil (Popery) has been driven out of us, seven worse ones have come down upon upon us, as is the case with Princes,Lords, Nobles, Citizens and Peasants." 4. "In all classes frivolity and every kind of vice, sin, and disgrace are now much greater than formerly." 5. "I think it must needs be the case, that those who follow the Gospel (literally "who become evangelical"), should be worse after (receiving) the Gospel than they had been before, not on account of the Gospel, but on account of the people who so abuse the Gospel." 7. "People are now possessed with seven Devils, whereas formerly they were possessed with one Devil; the Devil now enters into the people in crowds, so that men are now more avaricious, unmerciful, impure, insolent. than formerly under the Pope." 8. "After the dominion and power of the Pope has ceased the people, while despising the true doctrine, are now changed into mere irrational animals and beasts; the number of holy and pious teachers becomes constantly less." 9. About a year before his death, Luther confesses: "We are living in Sodom and Babylon everything is daily getting worse." 10. The town of Wittenberg was the principal scene of Luther's activity. It was there that he resided. It was there, if anywhere, that the results of his teaching ought to have made themselves felt. Now, about seven months before his.death, Luther wrote to his wife,"Away from this Sodom (Wittenberg) I will wander about, and sooner beg my bread than allow my poor old last days to be martyred and upset with the disorder of Wittenberg." 11. We find Luther owning that he would never have begun to preach, if he had foreseen these unhappy results, and that he scarcely knows whether he ought to continue preaching. His words are "See how foolishly the people everywhere behave towards the Gospel, so that I scarcely know whether I ought to continue preaching or not." 12. Writing on the same subject, he says: "If God had not closed, my eyes, and if I had foreseen these scandals, I would never have begun to teach the Gospel." 13. In 1538, more than twenty years after the beginning of the Reformation, Luther dwells on the same thought: "Who would have begun to preach, if we had known beforehand that so much unhappiness, tumult, scandal, blasphemy, ingratitude, and wickednesswould have been the result ?" 14. The new Gospel did not even make Luther himself better. He writes: "I confess that I am much more negligent, than I was under the Pope, and there is now nowhere such an amount of earnestness under the Gospel, as was formerly seen among Monks and Priests." "The more and the longer we preach, the worse matters grow." There does not appear to be an English translation of the complete context of this quote available. O'Connor cites "Walch XII. 2120." This is a 1530 sermon on Roman 13:11-14. The sentence in German is "Aber je mehr und länger es gepredigt wird, je ärger wirds." It can also be found in WA 32:219.